Liveaboard operators from Thailand make special arrangements to enter Myanmar’s Mergui Archipelago. 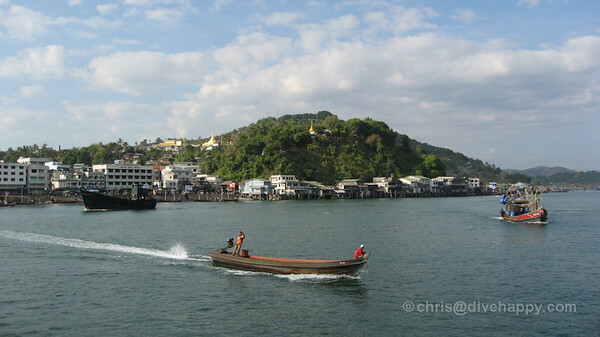 We do not use the same procedures as you would if you entered Myanmar by plane or overland. A Myanmar Visa is not required. Myanmar entry fees are currently $200 US per person, per entry (*not per day*) This fee is required in US cash only, new bills please (no checks, credit cards, or other currencies are accepted for this fee). This is the policy of the Myanmar authorities, not our policy. Please buy the US dollars before you arrive in Thailand. Foreign currencies are difficult if not impossible to buy in Khao Lak or Phuket without a lot of work and wasted holiday time. If your country of citizenship requires you to have a Thai visa, please make sure you get a double entry visa as in most cases you will be leaving Thailand. So, please check with the Royal Thai Consulate in your country for further information. This information must be emailed or faxed to us at least one week before the trip departs. FOUR copies of the front page of your passport. FOUR copies of the Thai entry stamp and immigration card (received upon arrival into Thailand). Note: These rules change from time to time. Most of the time we can sort it out upon your arrival, but please have the above paperwork ready in a clean envelope separate from your other travel documents. Please have the US cash in this envelope as well – please provide the exact change and new bills. This makes our entry and exit procedures much quicker and easier.